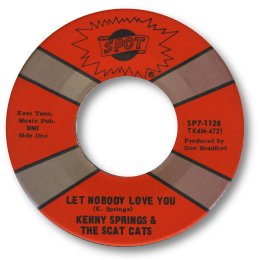 A fine double sided piece of Nashville soul from Kenny Springs released on a label based in Johnson City, TN. “Nobody Else But You” is a melodic toe tapper which really swings but the tasteful ballad Let Nobody Love You is the pick of them. Kenny hoarse vocals are a real treat and he really lets go with a couple of throat tearing screams as he puts his soul into the selfpenned number, The guitarist deserves a tip of the hat too for his restrained but beautifully constructed licks. I don’t’ know of any other 45s from the Golden Age by him but Kenny is now making R & B and Christian music as you can see/hear at this site.